The past few hours I’ve been wandering around my house in my pyjamas, longing to write but not knowing what to write about. It seems I’ve exhausted almost every aspect of myself on this blog already. As the frustration built and built within me, I realised there is one topic I am yet to write about. Ironic as it is, that topic is where I find my inspiration when writing. It’s difficult to say exactly what leads me to a blank Microsoft Word document with a mug of tea in hand, but I’ve come up with a few ideas. First and foremost, the bulk of my inspiration comes from real-life events. Things that have happened to me in the past, issues I am currently working through, or even issues I have watched others go through. I write about my experiences, my emotions, and my opinions. It may sound self-centred and somewhat egotistic, but that’s my style. I don’t just write for the benefit of others’ reading habits and entertainment, I write as a form of expression and release. To be honest, I’d say the person that benefits most from my blog posts is myself! Another area I draw inspiration from is music. I listen to a wide array of artists and bands, ranging from the likes of You Me At Six and Paramore to Taylor Swift and Ed Sheeran. Not a day goes by without my iPod being played, whether it be Kelly Clarkson in the shower, or Alesso whilst getting ready to hit the town. Music helps me open my mind to stories and experiences I love to remember or long to forget. Either way, it triggers something inside of me and I feel the creativity pouring out. 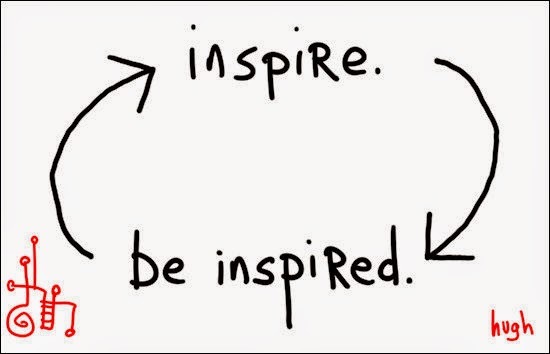 Oftentimes, people are the greatest source of inspiration. I am inspired by different people every single day, and they don’t realise it most of the time. Observing is a skill and just happens to be something I am very good at. I like to watch people going about their normal routines, or listen to their opinions on anything and everything. You can never tell when someone is going to say one word or one sentence that will spark inspiration inside of you. One thing that really drives me to succeed in writing is seeing others doing well in their areas of interest. For example, seeing others in my course getting work published or sharing links to their own blogs makes me want a reason to share a link to mine. I don’t mean it in a competitive way obviously, it just works as a source of motivation. For me, that’s a great thing. I can only see it as a positive that we motivate each other to write more often. Having said that, getting work published is not my main concern. In fact, I have never once tried to get any work published. I write because I enjoy it, and I love making something beautiful from words. Many of you may be wondering how a basic blog post can be beautiful, but I guess that’s something I can’t really explain to you. It’s like when an artist paints a picture or a poet writes a poem. A finished blog post is, to me, lyrical and expressive. Some people express themselves through music; I express myself through writing. I’m sure there’s one source of inspiration you are waiting for me to state, but guess what? I don’t read. Shock, horror I know. A journalist in the making that doesn’t read. Is that even possible? Of course it is. Back to inspiration, though. I can imagine how much more I would have to write about and how much more open my mind would be if I read any sort of writings, but I don’t. I’ve never been interested in reading and I’m not sure I ever will be. I like to read other blogs and some feature articles in magazines, but that’s literally it. The last book I read was “The Fault In Our Stars,” and that was about two years ago. I can’t even read a newspaper without getting bored. Not your average journalism student but hey, c’est la vie. What inspires and motivates me most to keep this blog going is my love of writing. From serious to light-hearted, poetry to personal essays, I am in love with the English language. It is the reason I’m in the course I’m in. I’ve never been interested in reporting facts and writing without an opinion – that bores me to death. I write what I write not because I feel it’s relevant and current in society, but because it’s relevant and current to me. And that’s the way I will write for the entirety of my career. If you read otherwise, I’m most likely a POW in a Nazi newspaper and you should really come help me out. I like your writing. It's smooth and clear. And true.